The shoulder massagers are adjustable to accommodate various heights and builds. Typically the shoulder massagers are stationary and can not be adjusted, neglecting the taller and shorter users. 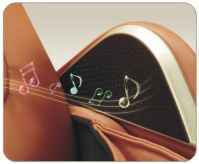 Directly above the shoulder massagers are hi-quality speakers that will sync with your device to play your favorite tunes while enjoying your personal massage. The hip massagers inflate and deflate creating a multitude of different massage actions. 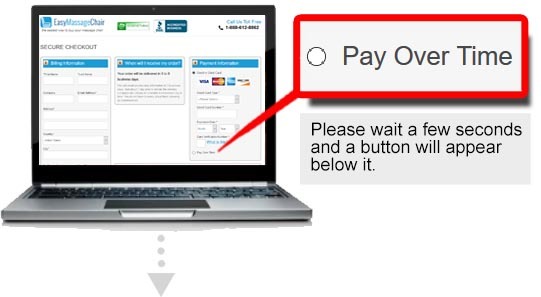 When only one side inflates it promotes a twisting action. When both sides inflated it compresses the hips inward providing a firm squeeze. 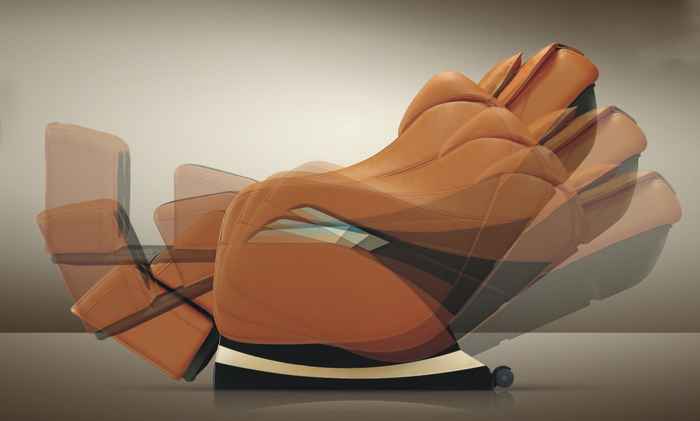 Located on the seat base are airbags to prop one side higher than the other adding a new dimension to the hip twist. In the lower back along the lumbar region are 2 heating pad that reach a soothing temperature of 104 – 122 fahrenheit. With the heat application it will enhance the feel of the roller head massage. Along the outer waist air additional air bags to compliment the hip airbags. 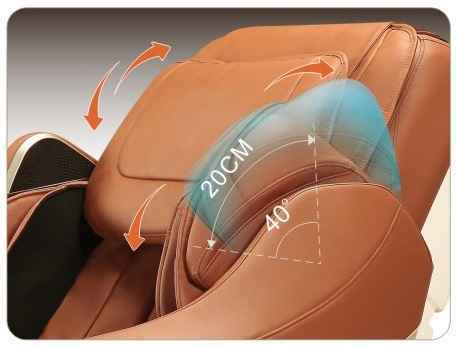 The airbags in the backrest will inflate independently to promote a deeper twist. On the center of the remote is the auto recline position button. If you press once and it will go into a reclined position with the seat base slight more pitched. Press it a second time and the chair will be in the full recline position placing the feet close to heart level. 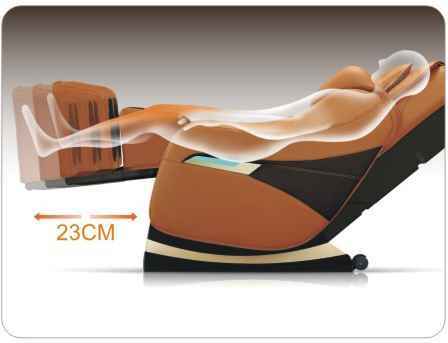 The recline position can be customized. The preset recline settings are recommended recline positions. The foot massagers has 3 rows of rollers on the base. Typically most chairs have 1-2 rows, covering only the toes and bridge. With 3 Rollers, majority of the bottoms of the feet are massaged including the ankle and Achilles. At the rear of the foot massagers are airbags intended for squeezing of the ankle and heel. With a close toes system the toes are pampered with an independent toe massage which is refreshing after a long day. The 3D massage technology provides a much more consistent massage throughout the back. The natural curves of the spine requires the rollers to be able to retract in and out to compensate for multiple levels of depth as it rolls down the back. With 3D technology this now possible! 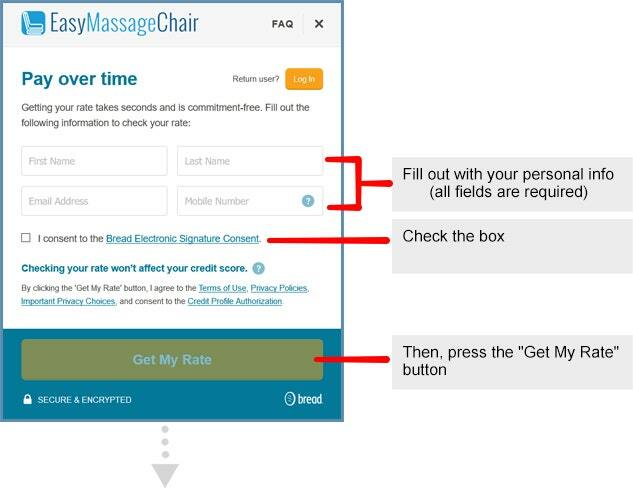 A consistent amount of pressure is applied to the massage, enhancing your massage experience. On the top of the shoulder the massage heads will protrude forward pressing down from the top of the shoulders. 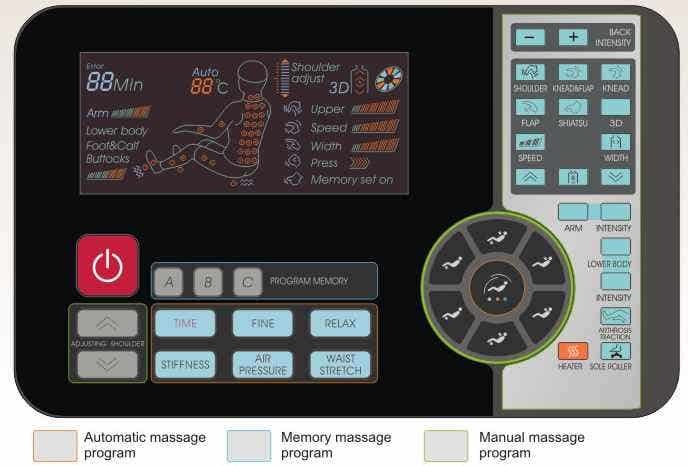 This innovative massage technology has received high praise for its life like feel. 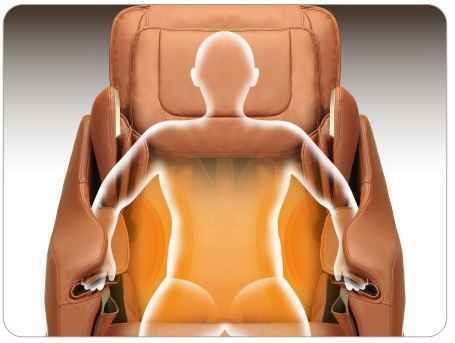 From the shoulders down to the feet, there are a total of 61 airbags thoughtfully placed throughout the chair, massaging all the key areas for an effective massage. 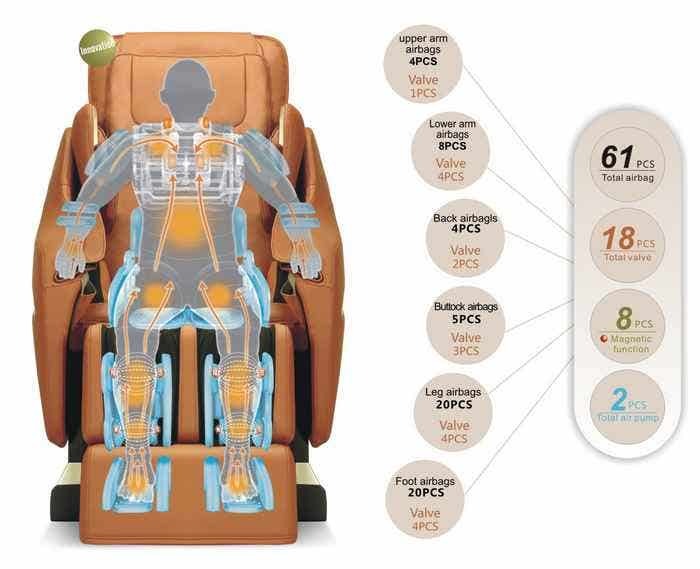 61 airbags are complimented with 8 magnetic nodes and 2 air pumps for a dependable and strong massage. 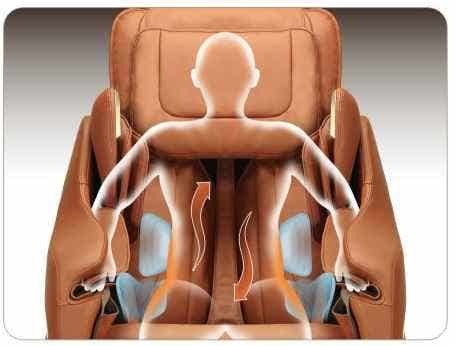 The airbag massage intensity can be adjusted to 3 levels, mild, medium and strong. The added innovation is that you can control the intensity independently from the arms and the legs. Most chairs the intensity of the air pressure is the same throughout. There are total of 6 preset programs. Each one focusing more towards a specific massage discipline and style. Instead of fussing with custom a program, you can simply press one of the 6 professionally design preset programs. Select from TIME, FINE, RELAX, STIFFNESS, AIR PRESSURE and WAIST STRETCH. The remote is mounted to a stand that swivels and moves forward and back. 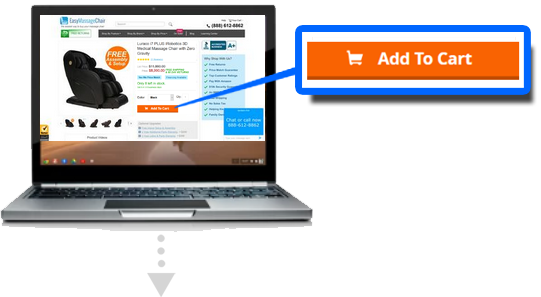 The remote has color coded indicating functions of the buttons. The Large VFD color display allows you to see what the chair is doing and where it is massaging. 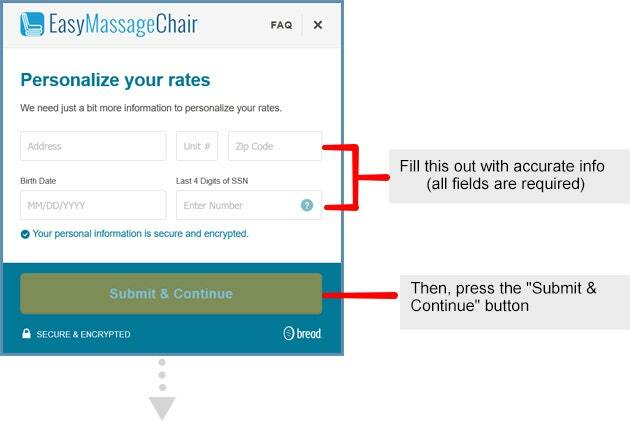 Sync your music from your phone or tablet to the chair and play your favorite tunes as you enjoy a relaxing massage. The high quality pumps out a clear and crisp sound dampening the sounds of your surroundings. Shoulder, Knead and Flap, Knead, Flap, Shiatsu. Love <3Review by Barbara M.
I bought this a week ago, and I can't say enough good things about it. I just LOVE it! My feet and calves hurt like crazy after standing on them for a long time, so as soon as I get home, I put them into this massage chair, and I immediately begin to relax. I highly recommend!